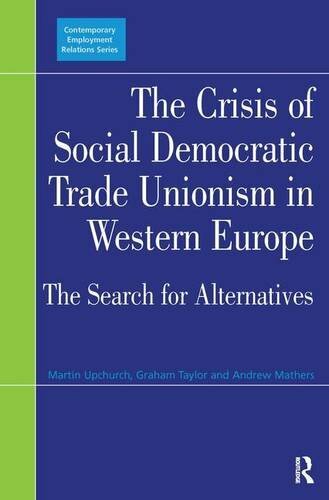 Crisis Of Social Democratic Trade Unionism In Western Europe (Contemporary Employment Relations): 9780754670537 Hardcover - LIMEROCK BOOKS INC. There is a developing crisis of social democratic trade unionism in Western Europe; this volume outlines the crisis and examines the emerging alternatives. The authors define 'social democratic trade unionism' and its associated party-union nexus and explain how this traditional model has been threatened by social democracy's accommodation to neo-liberal restructuring and public service reform. Examining the experience of Sweden, Germany, Britain and France, the volume explores the historical rise and fall of social democratic trade unionism in each of these countries and probes the policy and practice of the European Trade Union Confederation. The authors critically examine the possibilities for a revival of social democratic unionism in terms of strategic policy and identity, offering suggestions for an alternative, radicalized political unionism. The research value of the book is highlighted by its focus on contemporary developments and its authors' intimate knowledge of the chosen countries. Martin Upchurch is a Professor of International Employment Relations at the Middlesex University Business School, Middlesex University, UK, Graham Taylor, is a Reader in Sociology, at the School of Sociology, University of the West of England, UK and Dr Andrew Mathers is a Senior Lecturer in Sociology at the School of Sociology, University of the West of England, UK.